In the late 90's, I was lucky enough to party at this historic establishment. You could actually feel the history and energy in every fiber of the place. While I am sure it will take dramatic license with the story, the movie looks like a lot of fun! They are aiming for an October release. The movie stars Alan Rickman as boss Hilly Kristal, who opened the night club in 1973 with the intention of running a country, bluegrass and blues establishment – then oversaw its transformation into the birthplace of US underground punk. The Ramones, The Police, Talking Heads, Blondie, Television and Dead Boys are among those featured in the movie, which includes Foo Fighters drummer Taylor Hawkins as Iggy Pop. 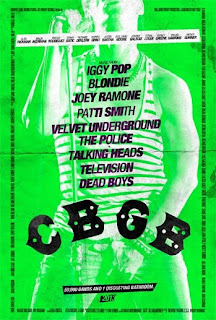 CBGB closed in 2006 following a rent dispute with its landlords, and Kristal died the following year – but his insistence that every act he booked had to play all-original music is remembered as a golden rule that changed the face of American rock’n'roll.